One’s own individual creation bears his or her personal taste, tendency, dream, desire, and sentiment. But all these individuals become influenced by their surroundings, more or less. Genetic factors and environment guide our nerves. We learn and follow in order to exist. 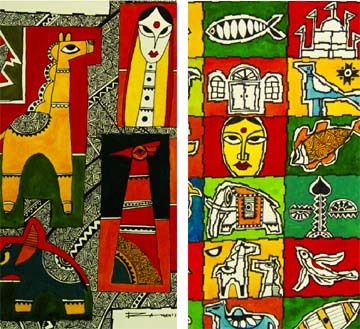 Alliance Française de Dhaka (AFD) organises an art exhibition titled Puzzle of Myth by artist AR Rumy at its La Galerie in the city’s Dhanmondi area from August 7. Basically our traditional motifs expressing rituals, beliefs etc are shown in his subtle strokes of pen and brush. Rumy has drawn the stories of the past to the present. Rumy is prominently guided by geometry. His forms, composition and sense of proportion remind it repeatedly. Rumy has worked on traditional Shital Pati (floor-mats made from plant fibre), Sholar Pakhi (one of the items from the good old days of village fairs), Nakshi Kantha, ceremonial masks, painted pitchers etc on colours: his red, yellow and black are singly distinct. The Inaugural ceremony of the exhibition is scheduled to be held today at 5.30pm. Zunaid Ahmed Palak, State Minister for the Ministry of Information and Communication Technology (ICT) will be present as the chief guest in the inaugural ceremony of the exhibition. A K M Barkatullah, Managing Director of Abed Holdings Ltd will be also present as special guest while Sadat Ullah Khan, Editor of magazine, Protibuddijibi will also attend the opening ceremony as the guest of honour. Artist AR Rumy’s solo exhibition Puzzle of Myth showcases a number of aesthetic pieces, drawn with soothing splashes of colours representing our heritage. AR Rumy was born in Natore in 1979. He did his BFA from Rajshahi University and MFA from University of Development Alternative (UODA). He is currently working as Assistant Professor at Faculty of Fine Arts of UODA. In 2006, Rumy did his first solo exhibition at Chuwa Gallery, Tokyo in Japan. Besides, he also participated in a number of group art exhibitions in home and abroad.